The time had come. King Bar-Ak Oba M'Aa saw that it was time to initiate the final phase. The American's economy lay in ruins, the military's leadership had been replaced with robots, and the humans had become accustomed to being treated as wards of the Government. Among the humans, the socialists welcomed what was to come, confident that their treason was justified. The ascendence of the Space Commies was at hand. It would be the vindication of the Hope and Change the King spoke of in the early days of his reign. Sufficient numbers of the humans had shown that they were willing to trade freedom for free stuff, and their congressional leaders had abandoned their duty to protect them from tyranny. Obamacare had served it's purpose, and there were no further obstacles to impede The Plan, save for the obstinate Patriots, who would soon be dealt with. The Masters had been right all along. They had asked the King whether the patriots existed in sufficient numbers to interfere with their plan. The NSA had compiled a database of the entire country, and had assembled a complete list of every citizen they thought might offer resistance. They had scheduled a briefing for the King, but he decided to play golf that day, so it was put off for another time. The King, not willing to admit he had neglected the matter, assured the Masters that there would be no resistance worthy of his might. Believing in their invincibility, they took him at his word. It was a fatal mistake, and it would doom their efforts. 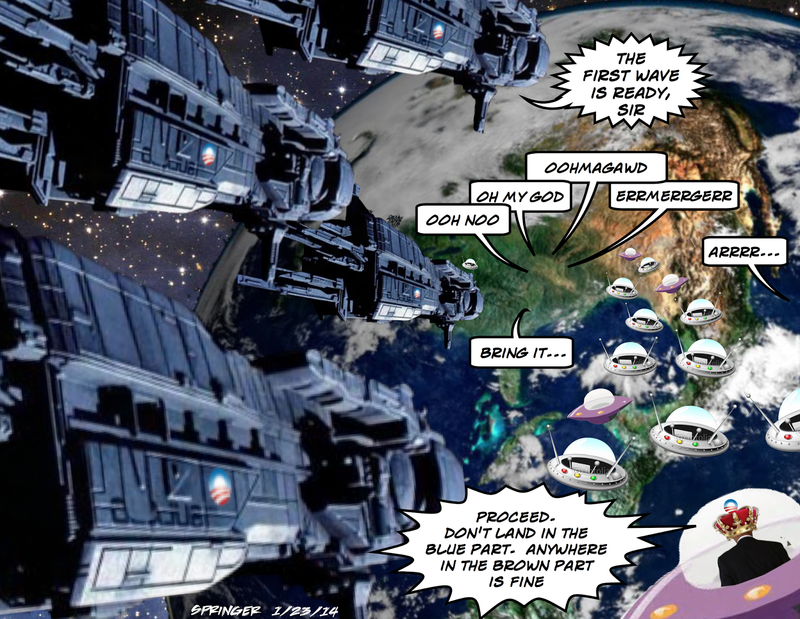 The fleet of warships assembled in orbit, and the battle would shortly begin. The King, leading from behind, gave the order to proceed. And silently, the Patriots waited…..